Lately we’ve been focusing on the local real estate market as we know all real estate is local. However, sometimes the national market helps us spot trends that may affect us in the future. National Housing Market Update. When Northern markets have struggled in past years it made it difficult for some buyers to purchase down here because they no longer had the equity they used to have in their current home or they just couldn’t sell their home to make the move down here. 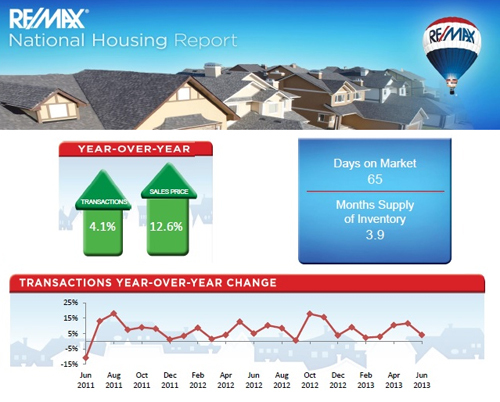 RE/MAX International releases a national monthly housing report which is a survey of 52 metropolitan areas. The latest report released in July shows transactions were up 4.1% over last year even though they dipped from May 2013 levels. This dip could be due to limited inventory nationwide. This year there are 23.9% less homes on the market. This would explain why we have only 3.0 months supply of inventory nationwide. This low supply typically indicates a sellers market. Rising rates may curtail transactions somewhat as less people qualify for what they used to just a few short months ago. Fannie Mae did a study that said this theory isn’t true. Sometimes rising rates act as a motivator. Inventory levels are probably the biggest threats to transaction volume right now. Local numbers haven’t been released at the time this article is written. Our internal analysis suggests a 30%+ rise in price over last year with all price ranges except for $100k and under posting fair to large sales gains. The reason the under $100k market is posting losses in sales is because with recent price gains there are fewer lower priced homes to sell. We saw exceptional strength in the $600-1 Million price range as well as the $250k-$400k range. We have 14% fewer active listings and a 17% rise in new pending sales locally. This too should drive prices higher going forward. To relieve some of this pressure builders are seeing more activity. Going forward building will become a viable option. The only downfall to building is locking in the interest rates. If it takes 6-9 months to build a home there is a significant amount of time rates could rise. Remember, a 1% increase in rates takes away about 9% purchasing power, so a buyer has to be careful when they select their home today that they can afford it when the home is completed. Locking in rates that long is almost impossible and costly if more than 45 days out. Perhaps builders will offer interest rate protection one day but either way it’s built into the price of the home. More than 800,000 homeowners regained positive equity in their home in the 1st qtr of 2013. This could spur more sellers to enter the market. Many homeowners have been trapped in their home and can now afford to make the move. Many are motivated to beat the interest rate hikes. Even if they wait for their home to go up a little bit more in value it still costs them to wait as the home they’re buying is also going up as are the rates to finance it. Waiting is a double whammy for a seller right now. If you’re thinking about making a move in today’s market, give us a call at 239-489-4042 We’ll show you your options and you can decide if a move makes sense for you right now. It always helps to get the facts before deciding one way or the other. Good luck and Happy Selling/Buying!!! Last month alone our YouTube channel www.Youtube.com/brettellisfl viewers watched 11,792 minutes of video. That’s over 196 hours of video. Of that traffic, mobile apps and direct traffic accounted for 51% of that activity. Germany was the leading country after the United States to watch our videos. Brazilians watched for the longest average duration followed by the Netherlands, Switzerland, and Austria. While it helps to have professional video and audio it isn’t required. Putting something at least decent up is better than nothing as long as the content is compelling and informative. One thing you’ll notice about our YouTube channel is that we’ve updated the skin to YouTube’s standards. This is a recent change Google has adopted. They want pages to look similar across platforms and devices. We created the beach graphics that have a similar theme to our Google+ Business Page. You can find a link to our Google+ page from Topagent.com if you’d like to see an example. They also requested different sizes so they’ll look good on a desktop computer, a tablet or iPad, and a Smartphone. Google is rewarding those who adopt their standards in local searches. For instance, if you search Fort Myers Real Estate on Google the Ellis Team at RE/MAX Realty Group comes up in their listed map search as well on various pages. The results in the various pages change all the time, but the map listings have stayed fairly constant. We believe using video heavily has helped how Google rates websites. We still do many other things as Google doesn’t rely on any one thing. However, by doing many things and using video helps raise the bar and in Google’s algorithms separates serious Realtors from less than serious. Google’s term is authority. They are trying to identify authority and reward websites that provide authority. 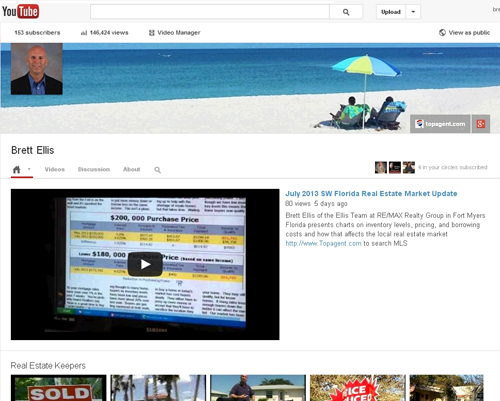 In addition to SW Florida real estate updates published on our YouTube channel, we have a separate YouTube source where we post our property videos. Video is playing an increasingly larger role in real estate searches. Some buyers are searching for agents and properties on YouTube and skipping the search engine process altogether. Look no further than teenagers today. They don’t search on computers much. They do search YouTube videos all day long, or do mobile searches on the phone. Agents today must change they way they market to reach today’s buyers. If you think teenagers are the only ones searching on mobile devices, just look around and watch people. Our analytics tell us who is searching, from where, and how long on our websites. The results will astonish. Our advice would be, if you want to attract more customers for your listings, step outside the box and try new things. Ask successful agents where they’re finding buyers today. Look around and observe people yourself, and if you see a niche, jump on it. We’re always looking for new ways to reach buyers and sellers, and if the market shifts in the future, (and it will) we’ll be searching for ways to capture that demand. So get out there and take some video and post it online. If it has decent audio and video, you’ll be glad you did. Good luck and Happy House Hunting/Selling!!!! What Do Buyers and Sellers need to Know Now About Rising Interest Rates? Interest rates have been rising, and we expect they could rise further. The primary reason is the Fed has indicated it will raise rates by scaling back or ending the quantitative easing as the economy improves. We’re not there yet, but writing from the Fed is on the wall and it’s spooked the bond markets. What Do Buyers and Sellers need to Know Now About Rising Interest Rates? 30 year mortgage rates have risen over 1% in the past 7 weeks. You’ve probably heard Realtors say “Now is a great time to buy with rates so low.” Here’s what you need to know about rising rates as a buyer or a seller. Buyers, in the past month or two you just lost about 10% purchasing power. Your income won’t buy as much as it did back in May. Did you get a 10% raise this year? Most people didn’t, but the cost of buying a home is going up. For most buyers the increase in rates means they’ll have to buy less home. Their income didn’t go up, so they either have to put more money down or borrow less on the same income. This isn’t a pleasing thought to many homebuyers as inventory levels have been low and prices have risen about 20% over last year. Buyers are getting squeezed at both ends, and rates may get worse. If you’re living in an apartment or renting a home, now may be a time to get serious about your options. Prices usually stagnate this time of year. See last week’s article. However, SW Florida is adding two new companies with employees who will either be looking to rent or buy, so this will add to the pressure on the inventory. Who knows how this will affect prices. There are several variables in play for our local market. Construction has been picking up to help with the shortage of resale homes but that takes time. Waiting to buy a home in today’s market has cost buyers dearly. They either have to pony up more money or accept that they’ll have to sacrifice the location they desire or features in the home. Of course, expectations are all relative. A buyer will afford less than a few months ago, but considerably more than back in 2005, so it’s all relative. Buyers have just lost 10% purchasing power. Even though we have low inventory levels this means that fewer buyers now qualify for your home. They may still qualify, but for lesser homes. If rising rates knock enough buyers down the ladder it can affect the market. 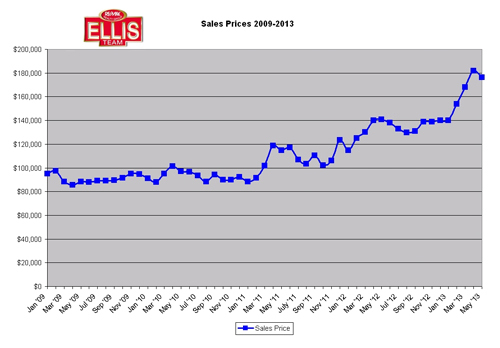 Our market has been doing well the past few years and prices have risen. We’ve had low rates the entire time and now that rates are rising, it will damper further increases. Until we get this economy humming like it should there is a cap to how fast prices will climb. Nobody knows the future on the speed of prices. We do know 2 companies are coming, and many up North are buying for retirement or enjoyment. We also know rates are rising. How these positive and negative forces counter balance each other will be interesting to watch. Our advice would be: Buyers, get your ducks in order and call us soon. Even if prices stay where they are for awhile, rising rates will hurt you. Sellers, don’t get too cocky. Rising rates will hurt buyers, and if it hurts buyers, it could eventually hurt you as the seller. Plus, if you’re selling and buying another home, waiting to sell could cost you if you’ll be getting a mortgage on your next home. If you’re thinking about your options, it would probably pay to sit down with us and discuss it. This is one of those times when waiting to see what happens may cost you. Or feel free to search the MLS at www.Topagent.com to see what’s out there. Good luck and happy buying/selling!!! Official housing numbers for May are in and both the median and average sales price are up over 20% over last year. The results are noteworthy and we expect the market to ride similar margins throughout the year, but the big gain in prices may have subsided for a bit. 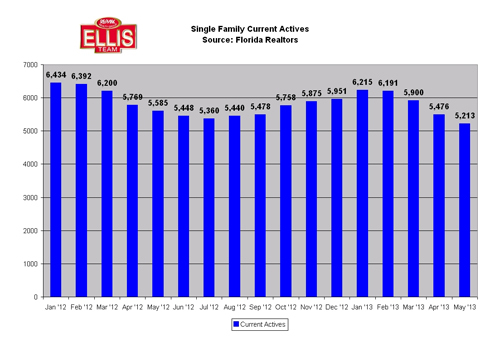 June SW Florida Real Estate Market Update. A few months ago we warned that prices were rising steadily however this is a trend we’ve seen repeat over the past several years only to watch the market cap out for the year around April-May. In several past articles we pointed out that beginning in May we’ll be watching the month over month prices to see how the market is faring in real time. This month we decided to post a historical price graph dating back to January 2009 illustrating the median single family home in Lee County Florida. Sometimes agents will make predictions based upon gut feelings on what they perceive is going on in the market. While this gut feeling can be a useful tool, it can also be deceiving. In the past I’ve spoken with different agents in a given month. One would be super busy and another would be having a lull, for whatever reasons. You can just guess which agent was more optimistic and which was more pessimistic that month. We prefer to make predictions based on facts, data, and logic. Yes we’ll throw in a feeling from the street if we hear changes in buyer’s or lending activity, but it has to be founded on some mathematical data to be meaningful. We try to pull out numbers that are meaningful and not just stats, because as you know, anyone can make stats say about anything. May numbers are in and they’re actually down from April’s numbers. May’s median price was $176,330 compared to April’s $182,000. May’s average price was $288,547 compared to April’s $292,201. If you look at the graph you’ll see this trend has occurred each year beginning about May for the past 3 years. Back in 2008 we predicted 2009 would be a year of bouncing along the bottom and that’s what it did. There just wasn’t a lot of price swings. January of 2011 was the beginning of the breakout in prices. Listing inventory fell again in May and pending sales are up, so why didn’t prices increase? The answer is our more expensive properties sell when we have the most affluent buyers here which is in season. We still have strong sales all year round, but not as many higher end sales. New pending sales have ranged from 1,465 to 1,485 from March through May. It’d probably be higher if we had more inventory, but not necessarily the prices. Remember, all real estate is local. This means that even though the market may plateau for awhile, there can still be pockets where prices increase. The whole market doesn’t march in unison. The low end could be appreciating while the high end is suffering. We’ve seen instances where prices get a little ahead of themselves in Cape Coral so people started buying in Lehigh because it offered more value. Sure, Cape Coral off water has always held a premium over Lehigh, but there are limits and we saw those back in the big buildup in 2004 and 2005. The same can be true with any area. If waterfront prices shot up instantly in Fort Myers at some point buyers would move over to waterfront in Cape Coral. Fort Myers may hold a premium, but there is a limit. Next month will be most interesting to see how the numbers fare. It really sets us up for the balance of the year if recent history has anything to say. of course, we all know recent history can be trumped by future news, so we’re also keeping our eye on the bond markets and how that will affect interest rates, the economy, taxes, etc. Stay tuned. If you’re in the market to buy, heed the warnings! Interest rates are on the rise. Waiting will cost you money. A month or so ago we posted on our Blog how the Fed’s pullback of QE (Quantitative Easing) may impact the stock market and affect interest rates. You may want to check out that article (May 23) at Is Stock Market Ready to Make a Move?